What is the best cat deterrent? Do cat repellents work? How do I stop cats from causing havoc in my garden? How do I prevent my cat from ruining my leather couch? These questions are very common to numerous gardeners and cat owners. But, are there real answers? Well, with so many cat deterrents available in the market today, from ultrasonic deterrents to best cat repellent spray, choosing the best is not an easy task. However, you should not worry about that. From homemade cat repellent to infrared cat deterrent, this article consists of some of the best cat deterrent options for every cat owner or a gardener. Read on for more! Pet-Safe SSSCAST is the best cat repellent spray. What we love about this spray is that it is ideal for both in the indoor and outdoor applications making it versatile. PetSafe SSSCAT spray pet deterrent uses a motion sensor to spray air to an intruder that it detects, scaring away your cat from kitchen tables, bushes, and even gardens. SSSCAT alternative is the best since it covers areas up to three feet. The unit works best with direct repellant. Whether you want to keep cats away from the kitchen, trash can, or the garden, it covers a small but precise area. It runs on AAA batteries and sends 80 to 100 sprays. According to SSSCAT Review, reviewers say that the spray keeps the cats’ off-limit both in the inside and the outside as well. It also stops feral cats from getting into the outdoor trash cans and digging up flowers. PetSafe SSSCAT refill lasts for roughly 200 sprays. That means it is enough to keep the cats away for a more extended period and instill a positive behavior. Even if the device works perfectly, the only thing that we did not like about the spray is that it covers a small area and so it is only ideal for indoor use since it may not work in a garden where you need a larger coverage. Even though PetSafe works for small areas like the indoors, it is the best in the market when it comes to effectiveness. The spray contains safe ingredients which mean it will correct your cat’s behavior in a safe way. Being a motion-activated animal deterrent, it sprays bursts of water when it senses an intruder. The device is great for keeping cats and dogs away from your lawn. With a contech scarecrow motion activated sprinkler, it frightens animals by emitting loud clicking noise and sprays them with burst water that is harmless. Each unit can comfortably cover 1,200 sq feet. Surprisingly, it uses a single nine-volt battery. For it to work effectively, you can stack it in every corner of your garden or property to adequately protect your yard. What we love most about this device is that it is one hundred percent safe and is an excellent alternative to chemical products. It also serves a double purpose, deterring all types of pests and animals as well as watering your lawn. One thing that reviewers did not like about the repeller is that with time, some cats and dogs got used to the noise and water and did not run away. That means it may not work with animals that are bold. Regardless of the con as mentioned earlier, if you are looking for a deterrent that will keep cats, dogs, fox, deer, and other pests away from your lawn or garden, Scarecrow animal repellent is the best. Cats dislike water and won’t dare come around the watery place. Do your tables and couches fall victim to the cat’s sharp claws? A sticky paw scratch is a product that you need to keep the cats away. Every box comes with five clear nine by twelve sheets that safely stick to your couches, table tops, and other furniture. The product deters the cats with a tacky feel that they usually hate. The product is a medical-grade adhesive, and it is safe for wood and fabric. However, it is good to test with a small corner of the furniture before putting it to the entire piece. According to reviewers, the product works well for cats and prevents them from scratching leather sofas, rugs, and even from jumping from one counter to the other. While it works well when indoors, it is not versatile enough and can hardly work outdoors. For example, it’s not possible to prevent cats from entering the garden. Do you want to protect your yard from stray cats and dogs, or your garden from pesky critters such as deer without using harmful repellents or expensive fencing? Orbit yard enforcer is the best motion activated sprinkler that covers a 1600 sq ft area. The device’s sensor detects up to 40 feet away with its sprinkler reaching up to 35 feet. It is very safe, effective and easy to use. The device is the only deterrent sprinkler with a night and a day option which means you can select different settings for detection to either day or night. The device offers flexibility to make sure your yard or garden is safe 24/7. With 35 ft adjustable impact sprinkler and 30 minutes watering setting, you can use orbit 62100-yard enforcer both as a cat or pest deterrent and a regular sprinkler. Just visit a motion activated sprinkler home depot and get those nasty cats off your garden. Some animals, like dogs, can attack it from behind and if the device falls, then no protection. The device produces a hiss of a compressed gas that entirely safe for animals to interrupt their unwanted behavior. The hiss is very similar to warning sign of a cat or a snake, alerting your pet to the danger. The device is handy to those looking forward to stopping unwanted behavior such as jumping from one tabletop to the other, scratching the furniture, stealing food, messing with trash cans, and any other unwanted behaviors that cats display. Numerous behaviorist and trainers from all over the world recommend this device since it works well. The device is a behavior enhancing product that effectively enhances the relationship between people and their pets. The primary purpose of this device is to gain automatic pet attention at the moment they are exhibiting the unwanted behavior. When the unit produces the hissing sound, it distracts a cat or a dog, and you can now instill a positive command and reward. However, you need to use the device responsibly. Never point it directly into your pet’s face. Also, it is not ideal for puppies, kittens, noise sensitive and nervous pets. The device may fail to give good results if you don’t get it out of your pocket on time. If looking for a device that you can put in place and stay comfortably without thinking about it, Pest-Soldier ultrasonic pest repeller 40/mo-$0.44-1 is what you are looking for. Pest-Soldier draws its power from the sun and needs almost no maintenance. The device’s glowing eye gives the cats a sense that someone or something is watching them and that scares them off. The device works by sending powerful ultrasonic sound waves once it detects an animal in the areas of coverage. Every unit covers 5000 sq ft with the use of either batteries or a standard plug. To install it, all you need is to place it on the exterior wall, a shed, or a fence. Adjust the sound frequency dial to send the tone to specific animals. While some sounds are so loud for human beings, some pest soldier ultrasonic reviews say that even after adjusting the sound, kids can still hear some of the noises. The Hoont pest repeller uses a pair of speakers to make any of the three ultrasonic frequencies, an intensity that you control. It is also possible to set the device’s sensitivity so that less intrusive animals like butterflies and birds do not drain your batteries. One good thing about the device is that it can get rid of every intruder by emitting powerful ultrasonic sounds and LED flashlights. Once the animals experience that they usually run away, the unit works with the use of ultrasonic sounds and LED lights to scare away different animals including cats and dogs. All you need is to follow Hoont Pest Repeller instructions and deter those unwanted animals in your garden. The unit is human and environmental friendly since there is no messy chemicals or dead animals. It is also waterproof due to its plastic and strong construction that helps it withstand years of heavy rain, wind, and snow. However, some cats may get used to the noise and lights, and it may not scare them. The Sentry Stop That cat repeller is very useful. It uses pheromone technology and noise to discourage bad behavior in cats. The unit is clinically proven to offer quick and efficient results without harming the cats. To change destructive cat behavior, the product combines an instant attention-getting noise and a pheromone mist that is scientifically proven. The spray mimics a natural pheromone and immediately refocuses and stops cats to stop their negative behavior by minimizing the level of excitement in what they are doing. For the product to work effectively, you need to use it when your cat is doing something terrible for example, when he is scratching your couch or jumping from one table to the next. Once you spray, the product produces the mist that reduces negative behavior by producing a pheromone and a quiet noise that scares the cat away. Next time, he will think twice before engaging in the act. According to Sentry Stop That reviews, after using the product several times, the client’s cats changed their behavior. If looking for a great cat repeller, Sentry is what you need. While Sentry is ideal for indoor use, it cannot help on the outdoor since you cannot stay in the garden the entire day waiting for a cat to spray. Reviewers rave about Sentry, stating that after just a few uses their cats started to change their behavior. If you’re looking for a cat repellent that works well for active training, Sentry is the best for you. Get rid of cats and other intruders out of your property with The Hoont Cat Repeller for outdoor. The unit eliminates the cats with the use of flashlights and ultrasonic sounds. The unit features a three ultrasonic frequency setting and an on/off LED flashing lights. The product works by emitting a range of ultrasonic sounds and flashlights to scare away cats, dogs, and other animals. The unit comes with an infrared motion sensor, and so the unit switches on automatically as soon as it detects an animal or pest. The unit is human and environmental friendly since it does not contain messy chemicals, no pesticides, and no dead animals. The solar-powered ultrasonic cat repeller eliminates the cats by emitting a combination of powerful LED flashing lights and ultrasonic lights, frightening cats, dogs, pests, and other animals away from the restricted area. The new version comes with a flashlight design; the repeller uses strong flashlights as well as an ultrasonic wave to deter unwanted animals. Since it comes with an infrared motion sensor, the device activates once the cat or any other animal enters the area of coverage. The unit is easy to use since all you need to do is to insert it to the soil where there is enough sunlight and turn it on. The device is easy and portable enough that you can install it in your home, yard or garden. The device works under different climatic conditions since it is waterproof, sun proof, windproof and free from rust. According to some reviewers, the flicking lights can go off after a while. The unit comes with cutting-edge technology and repels cats and other animals by producing powerful ultrasonic wave as well as strong LED flashlights when an animal approaches the area of coverage. The unit works when the PIR sensor triggers the repeller to emit the powerful sound and LED lights to frighten the intruder. The repeller generates a variable and irregular frequency that makes the unit more effective to deter even the most aggressive animals that are immune to certain frequency sounds. The product covers a large area of protection. It comes with double speakers with an extended degree to produce a sonic wave that can go up to 5000 sq ft. Since it comes with an advanced PIR, also known as a passive infrared sensor chip, it is very reliable and sensitive. The unit can detect an animal’s movement from a distance. Deter animals from your property than hurt them. The unit deters all sorts of animals off your property by emitting powerful LED flashlights and ultrasonic sounds. The repellent works only for middle size animals such as cats, dogs, deer, skunks, squirrels, bears, foxes, mice, rats, and many more. The unit comes with an infrared motion sensor, and it activates when it detects an animal. The repellent will reactivate only when it detects the animal again to make sure high effectiveness with low energy consumption. The unit comes with five different frequencies and four sensitivity modes. That means you can set the modes depending on the animals you wish to deter. You can also set sensitivity depending on the area of coverage. All you need is to take the unit out of the box and stick it into the ground with its aluminum stake. However, you need to remember that LED lights height should match the horizontal level of the animal’s eyes. Keep in mind that even if the device is waterproof, during heavy rains you need to keep it inside, which means your yard will remain unprotected. Ultrasound wave is the most common type of cat deterrent. The devices are either solar or battery-powered and scare away cats with a loud noise when they come close to your yard or garden. A significant benefit of these units is that they cause no harm to the animals, unlike other products that use chemicals. Most ultrasonic sound deterrents activate when a cat is within the area of coverage, usually one to two meters. The loud ultrasonic sound is inaudible enough to humans but very annoying to cats and other animals. Most people choose to buy these products since most ultrasonic cat deterrents do not have a battery life indicator making it hard to tell when they are about to die. The only downside with these deterrents is that you need to place them in an area with direct sunlight; otherwise, they won’t work. If looking for an indicator cat repellent, sprays are the best option. They usually contain odors that cats hate such as lavender and lemon. The smells can work in areas where your cat marks or go to the toilet. Since the smell is not pleasant to cats, it will stay there for days and will deter the cat from approaching the area in the first place. While these sprays are not a permanent solution, after some time, cats will forget going to that spot as the habit will go away. Besides, sprays are very cheap and widely available for all cat owners. However, as you buy a cat deterrent spray, make sure they only have natural ingredients to avoid harming your cat. Exposure to some chemicals may cause hair loss and rashes. On top of that, you need to do a spot test to make sure the spray does not stain your couch, table tops, and other furniture in the house. While we did not list any product under plant deterrent on the above list, they are a great deterrent as you can use them both indoors and outdoors. These are plants that cats hate and you can plant them in the problematic area in your garden or place them in an indoor plant pot. Such plants include lavender, rosemary, curry plants, and citrus plants. It is worth noting that not all repellant plants work for every cat. Some plants like curry plants cannot affect some cat breed. Such plants are not worth using, only if you are sure of which plant is useful to your cat. The reason is that they need a long time to grow and calls for a significant amount of attention because most of them are native to a Mediterranean climate. Warning: Make sure you check with your local garden assistants to know whether the plant will affect other plantation in your garden. Also, some plants are the weed, and you might find it hard to get rid of them once you solve the problem. Natural oils make eco-friendly cat deterrent sprays. 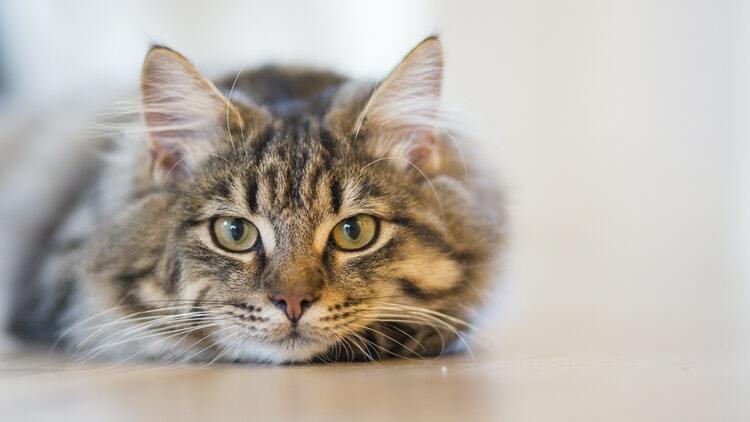 If you mix natural oil with water and shake up in a bottle, you can create a natural cat repellent that is ideal for any material. To know which natural oil that your cat dislikes, you can get the bottle top and place them under the cat’s nose. If the cat moves the nose away from the bottle, they probably don’t like it. While these oils are very useful, you need to experiment to get the ideal ratio of dilution. While battery-powered cat deterrents are useful and familiar to most people, they have one flaw, lack of battery life indicator! Since the sound is always so loud, it is somehow impossible to tell whether the device is working or not. If planning to invest on a battery cat repellent, keep in mind that you may need to spend the extra cash on a device with a battery indicator. However, they are very effective when it comes to keeping the cat away from the restricted area. With solar-powered repellers, you will face no problems when it comes to energy levels as long as you place the device in an area with enough sunlight. As long as you place it well, cats and dogs won’t come around your garden or lawn. Cats hate cayenne pepper because of its spice that agitates their skin. While you must not cover the entire garden with the pepper, you can scatter it in areas where they are messing up. That alone cat solves the problem. However, if you have a more severe problem, then you need to invest in a more effective product. For cat owners, deterrents are ideal training tools. When you notice your cat being naughty, like jumping from one table to the next or scratching your leather sofa, you can spray some compressed air at him to stop the behavior. Once you do it over and over, your cat will eventually get the message. Also, if feral cats or neighbor’s cat visits your garden and leaves a small present for you, use outdoor deterrents and he will learn that your garden is a no-go zone. If you want to mark a specific area in your house or garden, deterrents can do the trick. You can get the motion detector spray that has an equal effect as training spray. However, a motion sensor activates when the cat comes close to the device. Other ultrasonic motion detectors keep cats and other animals away from your garden or lawn. There are liquid and granule that you can spread on lawns or flowerbeds to deter cats from the spot with the smell. If you want to repel a persistent cat or dog, or cover a large area, try Scarecrow motion detector or a Sonic cat deterrent. Some deterrents produce unpleasant sound and lights that scare away cats, dogs, fox, and other animals. Every cat has different tolerance and preferences. You should not get discouraged when the first deterrent fails to work. With numerous cat deterrents, there is something for every cat. As you try to get the one that works for your cat, keep trying until you get the best. Size of the area you wish to keep cat-free is a crucial factor to consider. If you want to keep your cat away from an area or something in your house, you need to choose a localized deterrent such as an automated spray is a good idea. If you need to cover a larger area like a garden or yard, get an ultrasonic device since it covers a few meters radius and is a better choice. Never use a toxic deterrent to get rid of cats. For example, naphthalene flakes and mothballs may cause severe illness, organ failure, or even death. Also, it is good to remember that animal cruelty is an offense in many countries including Asia and harsh penalties. Also, these products are harmful to human beings and most especially kids. If a kid comes along a toxic substance when playing and decide to taste, that is dangerous. If you have a misbehaving indoor cat or a cat that loves entering the restricted areas in the house, you need to train him to stay with discipline. While that can take months of effort, it is worthy of your investment of time and money if you want to stop your cat’s naughty behavior. Some cats love wreaking havoc in the wardrobe, furniture, and table tops if given a chance. On top of that, cats love smashing even your favorite mugs when jumping from one dinner table to the next and pushing them into the floor. You can turn all these into your past and get a well-behaved cat with the use of indoor cat deterrents. The Pet Corrector is an excellent deterrent since it is a very simple but efficient deterrent spray. The formula is very safe for animals. The deterrent’s hissing sound is what the cats dislike. However, for the product to work, you need to stay at home and watch the cat. You have to catch the cat doing something naughty and use this spray to discourage the behavior. If you are a busy person and cannot afford to stay at home to watch the cat, there are automatic sprays that can do the trick for you. The biggest issue with indoor cats is that they all love it when scratching furniture. Can you imagine bringing home a new set of leather couch only to find your cat busy scratching and ruining your couch? Is it irritating right? Invest in a claw withdrawal or other products that work to deter the cat from scratching your couch. Numerous users record positive results and cite the products as the best when it comes to deterring cats from the couches. Cat urine is smelly and irritating. When raising a kitten, this is a common problem as they tend to urinate everywhere. It’s very frustrating! Sometimes it feels like the cat is doing it on purpose, to annoy the owner, but that’s not the case. If you want to discourage the behavior, you need to do something about it. There are several ways in which you can signal your cat to go outside or to her toilet if she is an indoor cat. All you need is to get a urine repellent, and a spray works best. A spray deters a cat from urinating on that spot again as it sends s a message that whatever she is doing is wrong. What you need is to spray on the spot, and since the cat will not like the smell around that area, he is less likely to go there again. Also, there are those sprays, like Pet-Safe spray that you can spray on her face when you catch her on the act. That alone will correct the behavior. When it comes to garden cat repellents, we have more than enough options. If looking for a natural deterrent, an orange peel works well, but some cats fail to go away after coming across the peel. In such a case, there is a stronger option, orange oil that you can dilute to act like a cat repellent spray for the garden. The smell is stronger, and it scatters throughout the yard, and most cats hate it the only shortcoming with this option is that you need to re-spray the garden after rainfall or once a week to keep up the smell. There are also advanced methods of deterring cats from your garden. There are ultrasonic deterrents that use loud noise and water splash to keep animals away. They are motion detectors that activate when a cat comes around the area of coverage. As much as you want to deter stray cats and other animals from your garden, you need to understand that there are legal complications. You need to tell your neighbor if using a new type of cat repellent as a failure that can lead to arguments and even lawsuits. However, most cat owners will understand your frustrations and recommend methods for you. You should never harm a cat by using toxic ingredients as a way to deter them. Also, you should not hit them or spray them with pipe hose or pressure washer. When you do that, they won’t understand your reasons and might keep coming back. In many countries, animals have rights, and so you should avoid harming them in any way. No one likes it when a cat misbehaves or cause havoc in the house or garden. Regardless of the cat deterrent, you choose to use, the most important thing is patience, especially when looking for the one that works. Just use the above information and get the best cat deterrent to keep cats and other animals away from your garden and have a good relationship with your cat in the house.